For years I’ve wanted to pair a kora player with an oldtime banjo player. Or get rhythm tap dancer Rocky Mendes together with swing fiddler Matt Glaser. We did just that and more at a recent concert, African Roots, Fiddle Tunes, and Fancy Footwork — one of two performances complementing Keepers of Tradition: Art and Folk Heritage in Massachusetts at the National Heritage Museum. 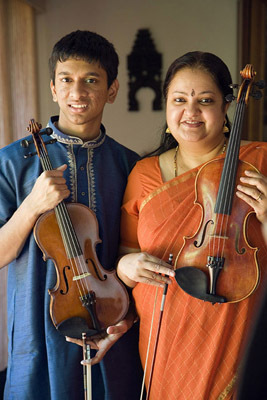 The concert gave us the opportunity to hint at the diversity of performance traditions thriving in Massachusetts today — African kora, old-time fiddle and banjo, swing fiddle, South Indian Carnatic violin, and Irish accordion and fiddle. This is music that makes people dance — and so we complemented the musician’s offerings with some of the extraordinary dance steps their music has inspired: rhthym tap dance and Irish stepdance. It wasn’t “Riverdance,” “Hee Haw” or “Bollywood.” It was the living, breathing root traditions from which they sprang. We’re putting something similar together for October 4th. Stay tuned . .